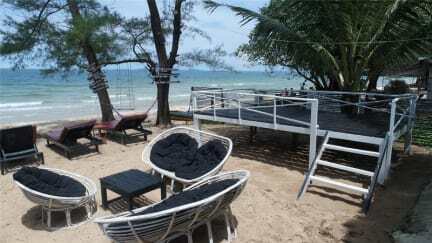 Did not stay there, because I was stuck on Phu Quoc. No ferries did go for days. But The Easy Panda cancelled my booking without charging - great! Had a great stay with good people around me. Hostel is right at the beach. Always went for a swim in the morning, such a great way to start your day. Staff was very friendly and helpful! And T and Sarah are lovely. I had a great time and would always recommend it and stay there again! Really friendly and nice staff! Very good food. One of the both toilets( including shower) was flooded with dirty water. Location next to the beach is super but it comes with a lot of mosquitos since the bungalows are kind of open. The hostel has chairs at the beach. Everything is feely accessible for everybody at the beach so you rely on your roomies to properly lock the door. The bathroom only has strange yellow water and sometimes no toilet paper. In addition, there are only two toilets for the whole hostel. Super sweet bungalow directly at the beach, good for a chill beach time. However the bathroom situation was not the best, the water was kind of brown and there were only 2 toilets which are also showers. Sometime the flush at the one toilet didn‘t work. Only book this Hostel if you like to Party! The wooden bungalows are okay, simple with rather hard matresses. Fine for the price. The welcome was very warm and we were inroduced to the facility. The problem was that the hostel lounge is a bar at night with very loud music and no closing time. 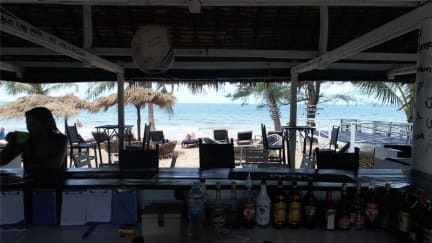 The bungalows are located right next to the bar and very badly soundproofed. It feels like you booked a night in a club. After asking the staff about it they replied that it‘s a bar now so yes..
Laute Musik lief von morgens 8 Uhr bis morgens 3 Uhr (von bösem Hiphop zu lauter Karaoke bis zu Reagge). War nach einem tag ziemlich anstrengend aber noch nicht der ausschlaggebende Punkt um unsere Abreise früher in Angriff zu nehmen. Drogen wurden uns ageboten und Suchtmittel wurden Tag und Nacht, grenzenlos konsumiert. Als wir dann um 7 Uhr morgens von zwei jungen Mädchend (klar auf Drogen) aktiv geweckt und um Hilfe gebeten wurden, hatten wir genug vom easy Panda und reisten ab.